yeah, maybe I'm "brain dead" but I haven't been in a silly cult losing time and money like you. I just wanted information for an artistic project, an item related with a particular experience of life, not just buy it on eBay, that's all. Please, don't be so arrogant. I just wanted information for an artistic project, an item related with a particular experience of life, not just buy it on eBay, that's all. So now let's talk about your alleged "artistic project", when will YOU get your Co$-tattoo to become a real artist ? Mine was very dainty....I thought it was pretty.....nothing you would wear, though....too feminine. Here are lots of pictures of Clear bracelets......and other Scientology jewelry.....for your artistic endeavors. The clear bracelet has no great significance. It isn't considered to have any talismanic power, not like some people might consider a crucifix or a religious medal does. It's just a piece of jewelry. I've never been into wearing jewelry, so I didn't want one. Also like most scn staff I was chronically broke, so I couldn't afford one. I think they were $100 in my time. God knows what they are now, but since we're talking scn they're probably ridiculously overpriced. Thank you very much for your help and advice. I've finally found one. It's pretty large, like a dog collar. Do you have any idea of when that 2 triangle logo was designed? hahaha, I'm not going to wear it!! I'm reading the thread with your story inside the organization and i'm astonished. "It isn't considered to have any talismanic power, not like some people might consider a crucifix or a religious medal does." Thank you very much, that's exactly what I wanted to know when I decided to open this thread. It's more like a fraternity tie or graduation ring. Nah, it really wasn't any of those things ... it was simply another cultic marketing ploy. A way of separating fools from even more of their money. Are you going to melt them down and cast a mini hubbard Buddha with them? He might be trolling. He doesn't seem to care what this symbol means even though he appears to be obsessed with it. is the Law, Love under Will." The KRC Triangle is used rather deviously. Like the ARC Triangle, lift or lower any corner and you lift or lower the other two. If you have Knowledge of a problem then that implies Responsibility and if you therefore do not assume Control of the area then that becomes an Overt/Withhold and you are on your way down the Scale of Responsibility and visa versa. Of course, furthering the goals of Scientology is the best way to go up the KRC Triangle and not applying the KRC Triangle makes you a putz. Church Executives Regges, Recruiters and FSMs love to push the KRC _ _ _angle as a way to realign personal priorities. You can also have your nose pierced and thread it through there. Easier for them to lead you around that way. think it was designed in the Fifties. I never liked it; was always uncomfortable with it but could never put my finger on why until Coryden hipped me to the Crowley connection. No, not compulsory to have to wear one. The two trianglexwas designed in approx 1951/52. Yes it was designed in 1951/52. The symbol with the two triangles was created/designed in 1951/‘52, and one triangle represents what we called the ARC triangle, and the second one the KRC triangle. 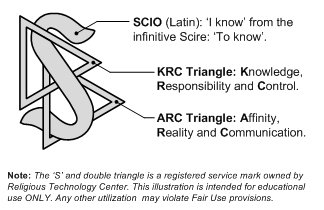 ARC = Affinity, Reality and Communication and KRC = Knowledge, Responsibility and Control. Basically, the basis of communication and livingness.